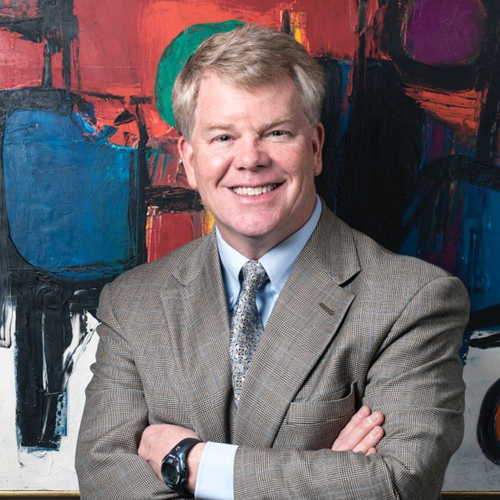 Passionate about connecting collectors with great art, David L. Dee launched David Dee Fine Arts in 2014. The gallery acquires and sells primarily art of the American West, with an emphasis on early Utah artists; itinerant painters of the Rocky Mountains and the Southwest; and Regional Modernism. Formerly the director of the Utah Museum of Fine Arts, David saw an opportunity to bring curatorial knowledge to both first time buyers as well as experienced collectors. Dee joined the Utah Symphony | Utah Opera Board of Trustees in September 2010 and became Chairman of USUO’s Development Committee in September 2011. He also serves on the Executive and Strategic Planning committees. David and his brother, Tim co-chair the Lawrence T. and Janet T. Dee Foundation, a Millennium Level donor to Utah Symphony | Utah Opera. In 2017, the foundation established the Elizabeth Brown Dee Fund for Music in the Schools through a $1 million gift that will continue to build and showcase USUO’s education outreach programs throughout the entire state.